Fans wanting to attend the MotoGP races this year at Motegi, Assen, Laguna Seca, Estoril and Sepang can now purchase their tickets through motogp.com and the travel partners Expedia. 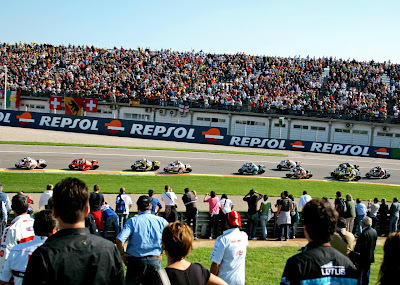 With the start of the 2009 MotoGP World Championship not far away, the sport’s army of fans across the globe are eagerly planning their Grand Prix trips for this year’s competition. MotoGP followers wanting to attend this season’s events at Motegi (Japan, 24th-26th April), Assen (Netherlands, 25th-27th June), Laguna Seca (USA, 3rd-5th July), Estoril (Portugal, 2nd-4th October) and/or Sepang (Malaysia, 23rd-25th October) will now find information available in Race Tickets section. Tickets for these events can now be purchased via motogp.com’s travel partners Expedia, in addition to the MotoGP visits to Losail International (Qatar), Jerez (Spain), Le Mans (France), Mugello (Italy), Catalunya (Spain), Sachsenring (Germany), Brno (Czech Republic), Indianapolis (USA) and Misano (San Marino), for which tickets were already available.